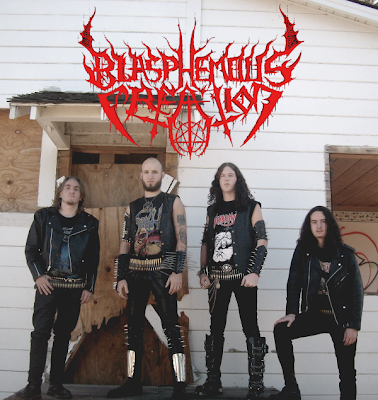 Blasphemous Creation are coming from Nevada Texas(U.S.A.).They pounding our ears with Black Thrash Metal with many Death Metal elements mixed in an old school wave Metal.Their first demo “Sounds Of Evil” is an absolute piece of great work espεcially at the sound and playing thing.Listening to their music you will realize their love for the classic extreme bands from the 80ies but also you find it soundιng in your head like many other bands of the 90ies especially God Dethroned and of course Angelcorpse.Many blast beats many chainsaw guitars and some times tempos and grooves Thrash to the bone.Right now their debut album is in stores..I wanna check it in any way.I like all 3 songs of the demo and I believe that B.C. will be one of the bands that many Extreme Metallers will discover and find them very interesting.Till then if you come accross their album, don't give it a second thought..Take it!If I can guess something during the listening of this piece of work I believe that their debut LP will be a real DYNAMITE!!! Αναρτήθηκε από HeadCrush στις 9:53 π.μ.